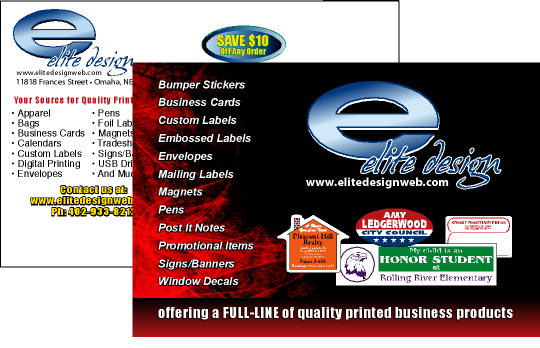 Elite Design specializes in custom postcard printing and full color postcard printing. Beautiful, vibrant full color printing on 14pt or 16 pt card stock will make your message pop and stand out from the rest. Available in a matte or glossy UV finish for maximum impact, Elite Design offers free graphic design and free proofs by email on all custom postcard orders. We have the absolute best prices on full color postcard printing and offer all the regular sizes as well as having the ability to do custom sizes and special shapes. Custom Postcards are a cheap yet effective way to promote your business or let clients know of special deals or events, or even use them as a coupon. To request a quote on a Custom Postcard Click Here . Quantity discounts available.